Perioperative renal failure is still one of the most feared complications of thoracoabdominal aortic aneurysm (TAAA) open repair and represents a strong predictor for early and late mortality. Despite improvements in renal cold protection, a key role for renal function preservation is played by the reduction of ischemic time: this aspect can be obtained by different techniques for renal reconstruction. Moreover, the possibility of vessel damaging and early occlusions must be considered upon deciding the operating technique. Similar topics must be considered for the visceral vessels, especially for those far away and difficult to expose. 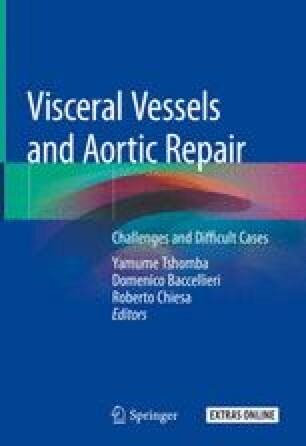 The use of the Gore Hybrid Vascular Graft (GHVG) with distal sutureless anastomosis for the separate reattachment of both renal and visceral vessels during TAAA open repair has proven to be feasible and safe, especially in cases of remote location of the vessel origin or with severe atherosclerotic disease of the ostium. The online version of this chapter (doi: 10.1007/978-3-319-94761-7_19) contains supplementary material, which is available to authorized users. W. L. Gores & Associates. Instructions for use for Gore Hybrid Vascular Graft. http://www.goremedical.com/resources/dam/assets/AP3350ML3.HYVG.US_IFU.pdf.